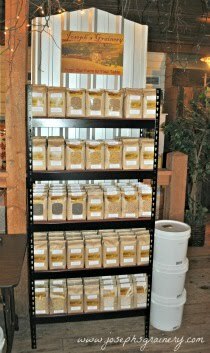 It's wedding season and we know how some of you LOVE to give the Joseph's Grainery Palouse Pack as a gift throughout the year. Well, sometimes you want just something that's just a little bit fancier, but you still want to give the gift of whole grian goodness. Well, we came up with the perfect wedding gift to incorporate your favorite whole grains. We started by purchasing two, plain glass baking dishes. We followed this tutorial on glass etching, and etched the happy couple's name into the side wall of each of the baking dishes. Then we added a package of wheat berries and a package of Soft White Whole Wheat Pastry Flour, included a few of our favorite whole grain recipes and gussied it up with some tissue paper and ribbon. I think any cook or baker would love to have a set of personalized dishes and what better way to start a new family off then introducing them to the whole grain goodness of Joseph's Grainery!